This is part 2 in a series about mixing songs for Autohypnosis. Last time we examined two different mono tracks that were re-amped for a stereo presentation [Mix Tip 1]. In the same song, Dimension, there was a stereo track that sounded pretty cool in isolation, but wasn’t sitting well in the full mix. I read some interviews with other mixers about “big mono” — where keyboard patches were technically stereo, but created using a chorus effect. Chorus (variable delay) gives neither a distinct location for sound sources nor a significantly wide presentation. Those interviews got me thinking that I should try creating an alternate version of stereo with this keyboard track. So I did. 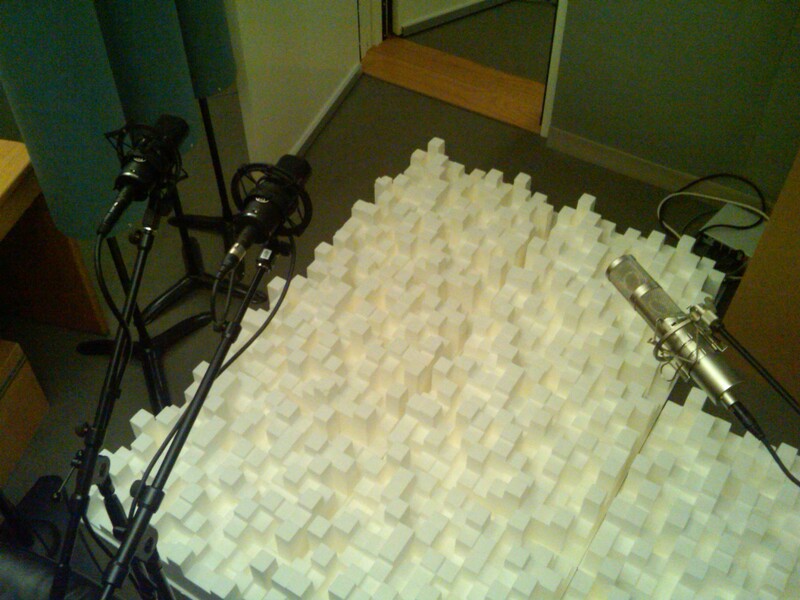 Diffusors on the floor, stereo mic arrays above. The wider spread I got from re-amping allowed me to tuck the chords in with everything else so they were audible at a lower level than the original stereo track. And it seemed to me that the chords worked better stylistically in this song when the sustain was huge, not narrow.